Former dairy farmworker now Workers' Center member Crispin Hernandez tells his story through an interpreter. "One of the most striking findings is that 9 out of 10 workers surveyed believe that their employers care more about the cows than about the workers themselves." The report found most dairy farm workers work 12 hours per day, six days per week, without a right to a guaranteed day off. 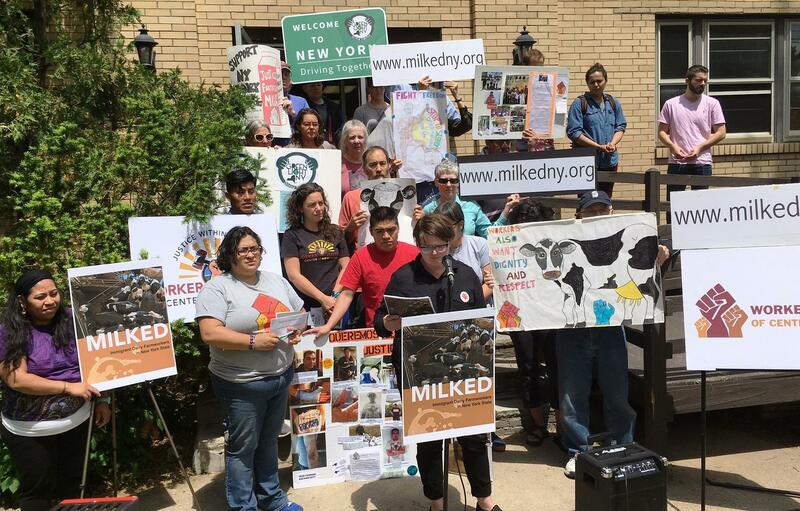 "Like all agricultural workers in New York State, dairy farm workers are excluded from a number of the basic labor rights and protections that many of us take for granted, including the right to organize and the right to overtime pay." "The owners did not like that we had a meeting in one of the trailers on the farm where I was with other co-workers. The son of the farm owner found out about the meeting in the trailer and called the police. Also present was Rebecca Fuentes of the Workers' Center, who we had invited to the meeting." Hernandez attempted another meeting a week later, but only one other worker attended. Both were ultimately fired. Hernandez is the lead plaintiff in a lawsuit pending in the New York State Supreme Court that seeks the right to collective bargaining. A team of academic scholars and community leaders spoke to 88 workers across 53 farms in central, western, and northern New York. Co-author Carly Fox with the Workers’ Center says hearing from the workers in their own words is groundbreaking in itself. "This report shows there are workers who are fearless, who are brave, who are courageous in coming forward to say what is happening," Fox said. "It is a collective voice of workers from across our state with experiences that are very real, speaking for themselves. That in itself is a revolutionary act to have their voice be published and out there, breaking that invisibility." The researchers say the report points out a cruel irony; the yogurt boom has made the dairy industry the star of the state’s economy while the workers who provide milking labor suffer. Former dairy farm worker Victor Hernandez says they feel isolated. "We work between 12 and 13 hours a day to give people food, fruit, and milk. Even though we work producing that, for us, it's really hard to access those foods." 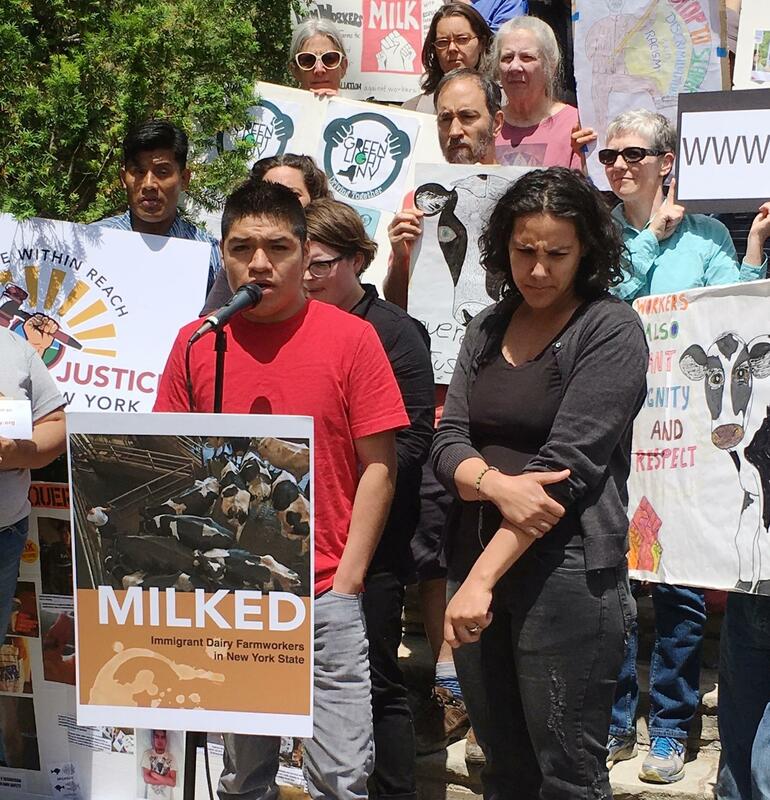 The report finds given their long work hours, their inability to obtain a driver's license, and their fear of immigration enforcement, dairy farmworkers have difficulty leaving the farm for much of anything beyond medical emergencies. Many referred to the feeling as "locked up." 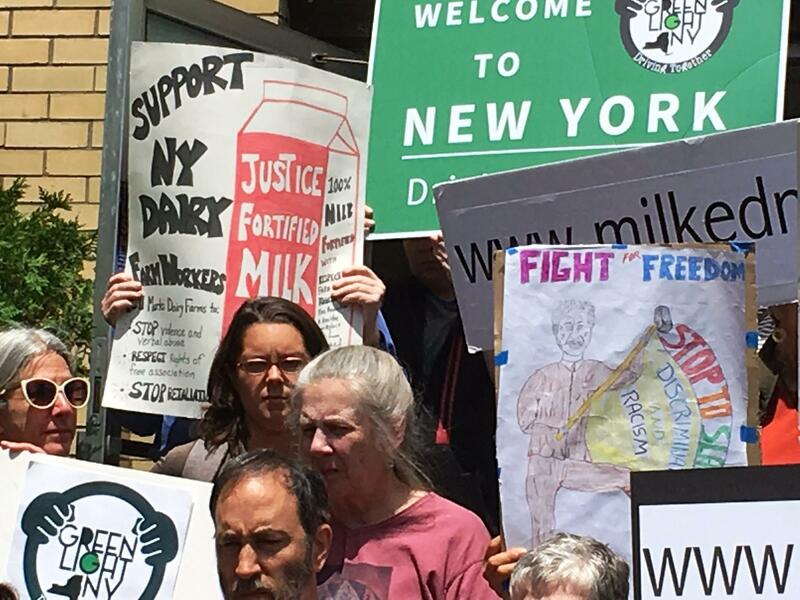 The report is at milkedny.org. SU Assistant Professor of Sociology Gretchen Purser at microphone in center is one of the report's co-authors.